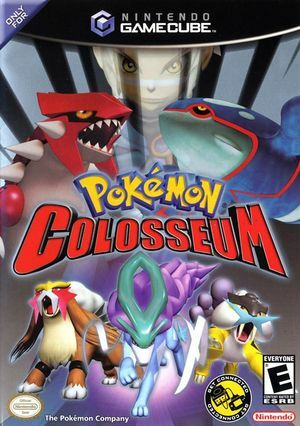 Pokémon Colosseum (ポケモンコロシアム, Pokémon Koroshiamu) is a role-playing video game developed by Genius Sonority and published by Nintendo as part of the Pokémon series, released exclusively for the Nintendo GameCube. 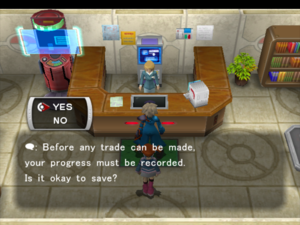 Unlike previous titles, the game does not feature random encounters with Pokémon, but the player can steal ("Snag") the Pokémon of other Pokémon Trainers. The game also features several battle modes for single-player and multiplayer gameplay. Pokémon Ruby, Sapphire, Emerald, FireRed, and LeafGreen can connect to this game through trading and Battle Mode. Those that pre-ordered the game received the Pokémon Colosseum Bonus Disc. In stable releases of VBA-M, the GCN-GBA connectivity does not work properly, causing severe slow-downs to the point where both games timeout before an emulated connection can be established. Although unstable and barely functional for Pokémon Colosseum, the recommended releases of VBA-M to use the GCN-GBA emulated hook-up are the WXVBAM versions. You may need to import the battery save that matches the game running in VBA-M while the GBA BIOS is active for Dolphin to establish the link properly. The save type for the compatible GBA Pokémon games are Flash 128K if automatic save detection does not work. If a GBA is selected for any of the ports except port 1 before the game is started, the emulator will ignore port 1 GameCube controller inputs. To fix, just set the ports to None before starting the game. It can be re-enabled once the game prompts you to if the user decides to try the GCN-GBA hook-up features without any ignored inputs. After visiting Mt. Battle for the first time, entering a trainer battle will cause a crash just before the opposing trainer's Pokémon are loaded. When playing the Arena mode in the PAL version, a crash can occur when attempting to register the Pokémon from Story mode to play later in the Colosseum mode. The built-in Widescreen Hack causes various glitches with shadows, leaving the floor completely black most of time. The following AR codes work as a replacement, causing fewer issues. To avoid conflicts, make sure that Widescreen Hack is disabled while using these codes. The graph below charts the compatibility with Pokémon Colosseum since Dolphin's 2.0 release, listing revisions only where a compatibility change occurred. 3.5-1749 Windows 7 Intel Core i5-3330 @ 3GHz AMD Radeon HD 7970 Playable. 30FPS (Direct3D11,1080p full screen with 2.5x resolution, 4x antialias, 2x antisotropic + OpenMP Decoder) Cutscenes can go up to 60FPS. New game might need to retry several time to create a new (raw) save. This page was last edited on 1 March 2018, at 05:35.